Ask parents of more than one child, and chances are, they’ll tell you that siblings run hot and cold when it comes to getting along. When brothers and sisters are calm, life is usually calm. But when sibling conflict rears its ugly head, it can become World War III in a nanosecond. Sibling conflict also is caused by foolishness and anger. While selfishness manifests itself as wanting to be first, having the best, or tattling on a sibling, foolishness is being mean or teasing past a certain line—not recognizing how your words affect another person. Anger has fairly obvious outcomes, such as hitting or yelling. Sibling conflict is unavoidable, but that doesn’t mean it has to throw your household into constant chaos. 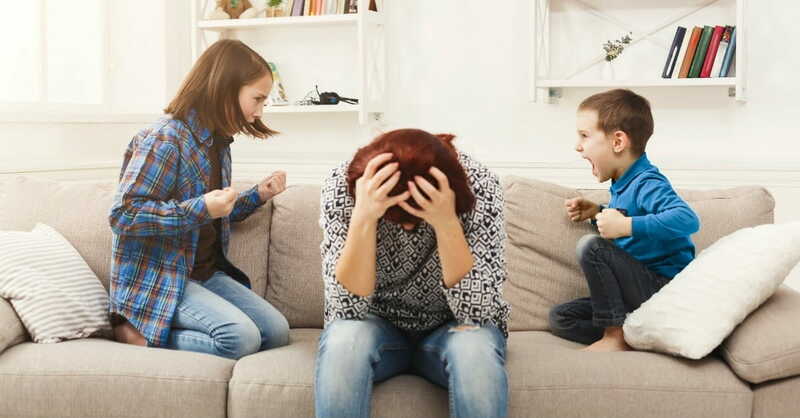 Both Yates and Turansky offer parents concrete ways to overcome sibling conflict. Be firm about not tolerating conflict. Parents should set clear boundaries and consequences for fighting. “Tell your kids that the family is not going to live this way anymore,” says Turansky. And then follow through on your words with actions. For example, a “Do not disturb the family peace” rule in which all brothers and sisters are held responsible for sibling conflict can be effective. Separate the kids. Send them to different rooms for a while so they can cool down after a fight. “Separation is a great way to avoid, reduce or stop sibling conflict,” says Yates. Put a positive spin on it. Focus more on the solution than the conflict. For instance, instead of saying “Stop hitting your brother,” try “Brothers love each other.” “We’re visioning with our children about the value of having sibling relationships,” says Turansky. Teach conflict responses. Show kids how to react when a sibling mistreats them. Coach them on how to improve their relationships with each other. “We want to change the culture of disharmony into one of harmony,” he says. Schedule one-on-one time. For example, Mom and Dad can take turns going out to breakfast with one child at a time on a rotating basis. “This can help alleviate some sibling conflict, because it gives each child some individual attention from Mom and Dad,” says Yates. Pray for—and with—your children. Bringing sibling conflict before God can help kids make positive changes in their sibling relationships. Once you recognize what’s behind the fighting and how to stop it when it happens, you also should teach your children how to resolve sibling conflict in a positive way. Respect for others. This encompasses respect for the person and her property. Make a house rule that no disrespectful verbal words or physical gestures will be tolerated. Yates recommends role playing to help children learn how to verbalize frustrations without attacking the other person. Also, stress the need to ask before taking another sibling’s property—and to return the possession in the condition it was received, such as washing a shirt after wearing it. Emphasize servanthood. Being a servant is the perfect antidote for selfishness. “Teaching our kids how to be servants is a very proactive and Galatians 5:13,” says Turansky. Transfer responsibility. Instead of a parent stepping in to solve the problem, have the children come up with the solution. For instance, when kids are fighting over a toy, have them sit down and discuss how to share the toy without assistance from Mom or Dad. Discipline children separately. Don’t punish in a group setting. “Each child needs a specific plan to deal with his own selfishness, and that plan is going to look different for child A than for child B,” he says. Change strategies as your children age. Be firm in their early years, and then gradually loosen up as your children grow up. “It’s moving from intentional coach to referee to cheerleader as they get bigger,” says Yates. Remember that even if you follow this advice, sibling conflict will never go away completely. But that doesn’t have to be cause for alarm or despair. Fighting can provide an important way for children to learn to get along with others. Sarah Hamaker is a freelance writer and editor, and author of Hired @ Home: The Christian Mother's Guide to Working From Home. She lives in Fairfax, Va., with her husband and four children, who are learning how not to disturb the family peace. Visit her at www.sarahhamaker.com.